Take a bowl. Add flour, cardamom powder, fennel seeds, baking soda and mix it. little water but make sure it is not too thin. Let it rest for 20-30 minutes. Take nuts and roughly chop or make thin slices. Keep it aside. 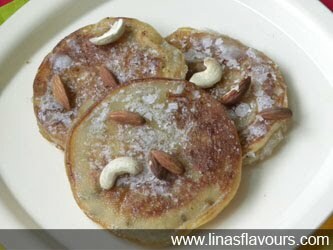 pancakes/malpua. Cook on both the sides till light brown. Drain it on the paper napkin. done to keep the syrup warm, otherwise it will crystallized. out and place it in a dish. Garnish it with nuts and serve. If you like you can serve it with rabdi also. Note: To make it farali/vrat item use farali flour instead of all purpose flour.